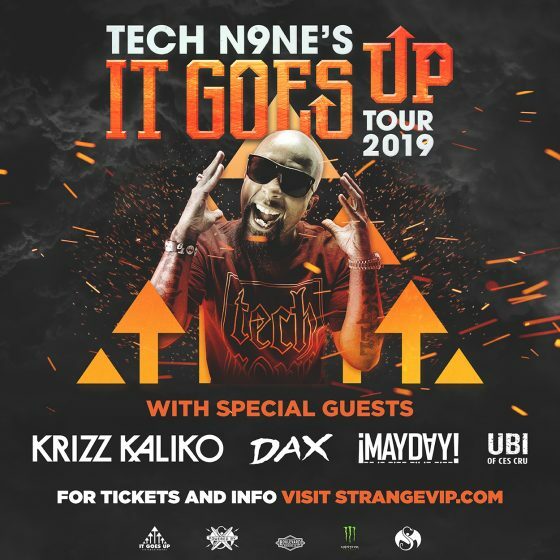 You’ve been asking for it and we’ve landed a show in Los Angeles for Tech N9ne’s It Goes Up Tour 2019! The tour will be stopping at the Novo on Monday 4/29 and we can’t wait to see you all there. We’re sorry for the late notice, but as a way to make it up to you, we’re pricing tickets at the lowest price point on the entire It Goes Up Tour! Click here to order your tickets and VIP packages to see Tech N9ne, Krizz Kaliko, Dax, ¡Mayday! and UBI of Ces Cru on Tech N9ne’s It Goes Up Tour 2019. DWAMN! LA! Happy to say that we locked in @thenovodtla for April 29th and we will be seeing you all for the #ItGoesUpTour 2019 with @thatsdax @krizzkaliko @maydaymusic @therealubiquitous! – Tickets go on sale TOMORROW and since y'all were so patient with us, we're giving you specially low priced tickets! I hope to see y'all out there!